Code Blue is designed to provide teenagers struggling from depression or bullying with support when they need it. Users can choose several contacts to be part of their support group. 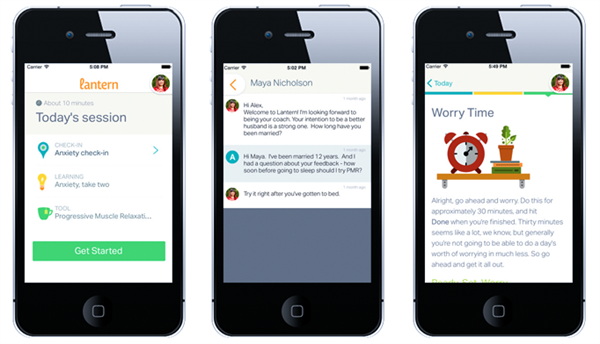 With just a few taps, the app will alert the support group that the user needs immediate help. Members of the support group can then text or call the user. The app can also share the user’s location with the support group, and members can indicate that they are on their way to see the user in person. 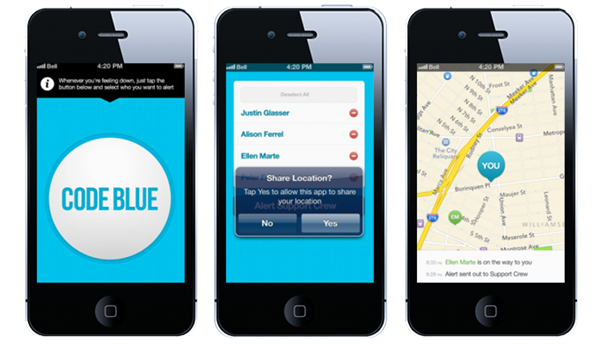 Code Blue will be free and is expected to launch this spring on both iOS and Android. 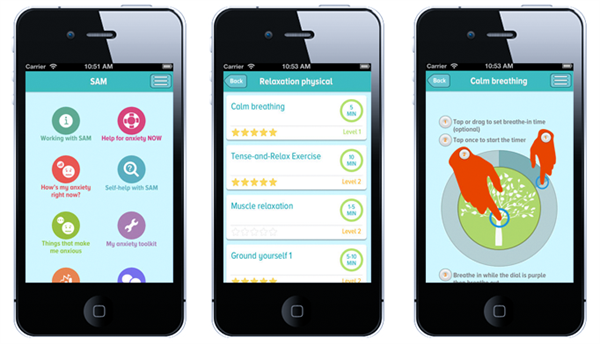 Breathe2Relax is an app developed for stress management. It walks users through breathing exercises that help to reduce stress , stabilize mood, control anger, and manage anxiety. 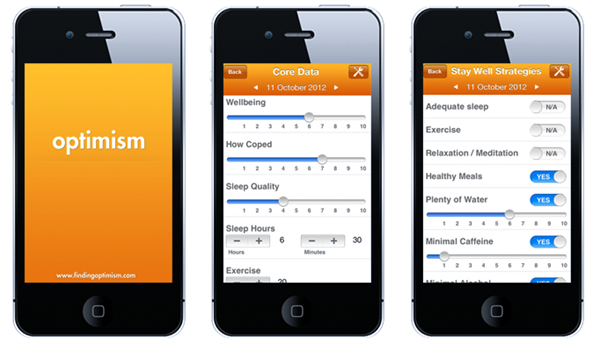 The app’s developers note that it can be used on its own to help reduce stress or in combination with other therapies. 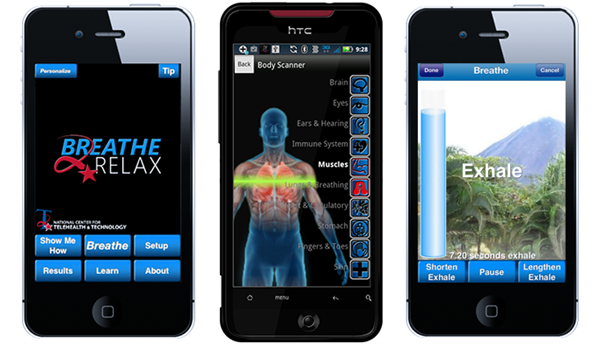 Breathe2Relax is available for free on both iOS and Android devices. Lantern is a web- and mobile-based platform that combines cognitive behavioral therapy (CBT) techniques with advice from real experts. Users start by taking an assessment test to determine their strengths and weaknesses in five areas: body, stress/anxiety, mood, sleep, and social life. Lantern provides daily exercises tailored to suit users’ needs based on the results of their assessment. Each user is also matched with a professional coach trained in CBT who can provide feedback and answer any questions. Lantern is a subscription-based service, with a monthly price of $75/month or $398/year ($33/month). Lantern is primarily web-based, but also has the option of a free, supplemental app for iOS devices. PTSD Coach is an app developed by the Department of Veterans Affairs’ National Center for PTSD, intended for use by veterans, military personnel, and civilians experiencing symptoms of post-traumatic stress disorder. It provides a self-assessment tool that allows users to track symptoms over time (though it does not clinically diagnose PTSD) as well as tools for managing symptoms. Users can also store contacts for personal support, locate nearby treatment programs, and contact the National Suicide Prevention Hotline quickly in emergencies. 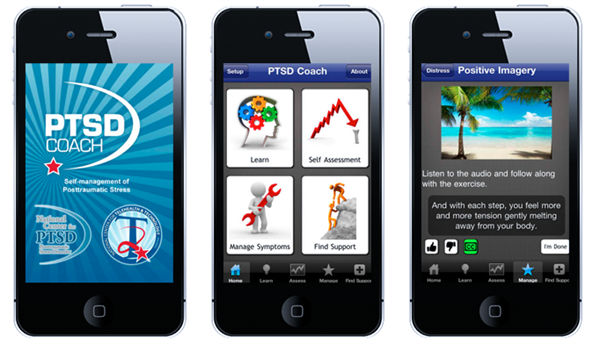 PTSD Coach is available for free on both iOS and Android devices. Optimism is available for download on Mac OSX, Windows, iOS devices, and various web browsers. Talkspace seeks to make therapy more available by connecting users with one of over 200 licensed therapists via messaging. With a subscription to Talkspace, users get matched to a therapist that they can chat with at any time. The creators of Talkspace note that their app is not meant to be a substitute for in-person therapy, and their therapists are trained to identify when users need more extensive help than the app can provide. 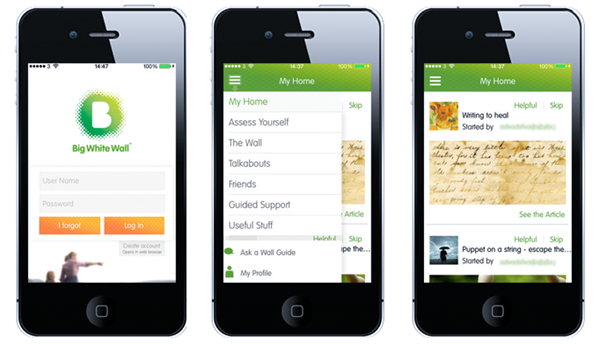 The Talkspace app is free to download on iOS and Android devices and includes access to public therapy forums. For unlimited individual messaging therapy, users must choose to pay a subscription fee at a weekly rate ($49/week), monthly rate ($99/month), quarterly rate ($228/quarter), or a yearly rate ($624/year). TalkSpace also features live video therapy and couples’ therapy at an additional cost. 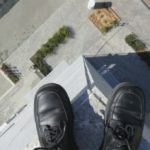 Big White Wall is a community application where people suffering from various mental illnesses can come together and talk about their problems with support from trained therapists. The app features discussion boards, reference articles, and self-assessment tests. Users can also register for online therapy programs. Big White Wall also lets users create a “brick,” which is a collage of pictures and images meant to encourage users to express themselves. The program focuses on anonymity as a way for members to feel fewer stigmas about sharing their problems. Big White Wall is available free for certain people in the United Kingdom. For those who don’t qualify, Big White Wall costs £25 per month (approximately $36.60). It also has a free, supplemental app available in the United States for both iOS and Android devices. 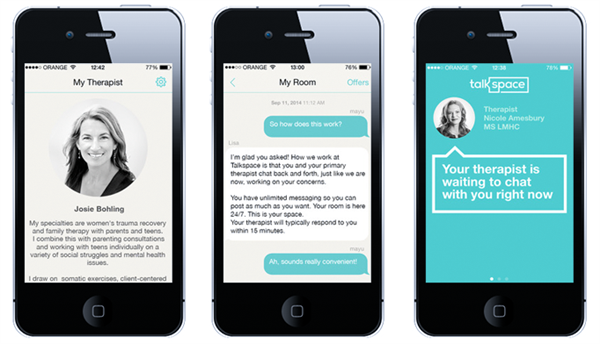 SAM is an app designed to help people manage their anxiety. Users can record their anxiety levels and identify different triggers. 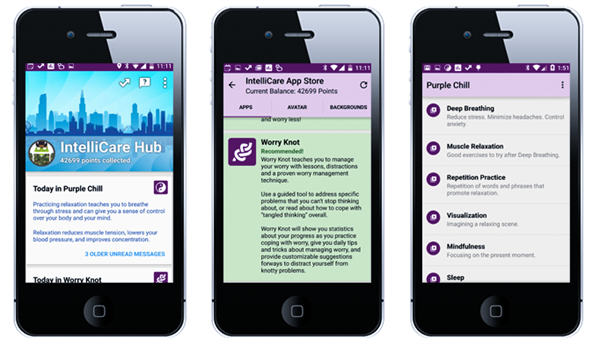 The app includes 25 self-help options to help users cope with the physical and mental symptoms of anxiety. Users can create a personalized anxiety toolkit, adding in the features of the app that they find most useful for easy access. The app also has a social cloud feature that allows users to anonymously share their experiences with other SAM users. SAM is available for free on both iOS and Android devices. IntelliCare is a suite of apps developed by researchers at Northwestern University to target symptoms of depression and anxiety. The apps were developed as a part of a national research study funded by the National Institutes of Health. The suite includes the IntelliCare Hub app and 12 mini apps. The Hub helps users manage their preferences and recommends apps based on their concerns. The mini apps include things like Worry Knot (for worry management techniques), Thought Challenger (to help reduce negative thought patterns), and iCope (for inspirational messages and reassurance). The IntelliCare Hub app and related mini apps are available for free on Android devices. Equanimity is a meditation timer that also features graphical tracking and a journal feature. 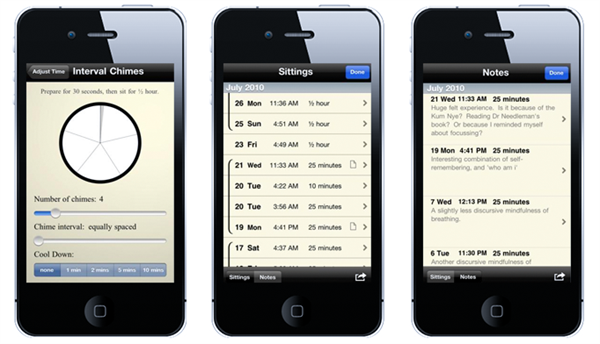 The meditation timer features simple graphics to minimize distractions during meditation. If users have several stages in their meditation routine, the app can be programmed to chime at the appropriate intervals. Users can view their meditation history in the form of a visually annotated log or a text-based journal. All of the data recorded in the app can be exported as an email or spreadsheet. Equanimity is available to download for $4.99 on iOS devices. As the prevalence of mental illnesses like depression and anxiety continues to grow, clinicians have turned to mobile applications as tools for aiding their patients’ treatment. These apps can be especially helpful for teenagers and young adults suffering from mental illness due to their frequent use of technology as a means of communication. The apps can be helpful as a way to engage people who may be unwilling or unable to attend face-to-face therapy, and they can also provide support in between sessions. Experts believe that these apps will work best when used in conjunction with medication and/or in-person therapy. Read through the slideshow to learn more about some of the best apps that can be used by patients to improve their mental health.